I'm currently reading this excellent piece of culinary history. 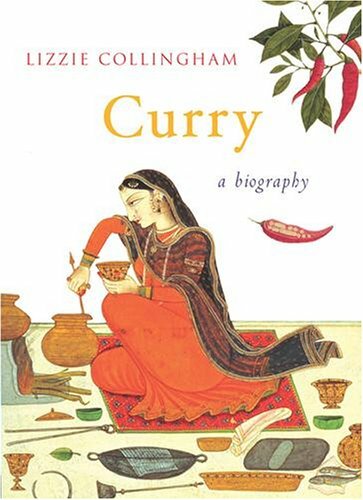 It charts the recipes we all regard as Indian and their history and the multitude of influences on Indian food. From the introduction of the chili and leavened bread making by the Portuguese into India (Vindaloo, she tells us, is the Portuguese dish carne de vinho e alhos through the Goan looking glass) to the lovely notion that Korma dishes can be related back to Irish Stew. She charts the considerable influence the British had and it is a surprising read for it. Brilliantly written and researched I'm loving it. She even includes recipes for various dishes and some you'll probably want to avoid, including one for Black Rat. So now in addition to having to read Salt, Cod and Vanilla I have to also read Curry? How will I ever get through all these books! i read about this book a while back and made a note to get a copy then i forgot all about it. now you've reminded me again.